Once this caveat is in place, however, Boyhood Island becomes a conventional memoir of Knausgaard’s childhood, beginning as he starts school and ending in adolescence. The adult Knausgaard is largely absent; there are no detours into the present as we have seen in previous volumes, or complex weaving of time frames. Both the previous volumes worked to some extent in contrast: the first contrasted his memories of his father with the circumstances of his last years and death; the second contrasted the origins of his relationship with Linda with the stresses of being a husband and father. The chronological nature of volume 3 reflects its subject: that of growing up. 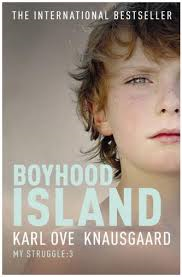 However there is also a clue in the title: boyhood exists as an island for Knausgaard, a time separated from adulthood, a different world. And it in is presenting childhood as a form of life outside adult experience that the book’s success lies. As always, Knausgaard inhabits the time he is writing about completely. This is not a writer reflecting on his childhood with irony and humour, but feeling it as it felt at the time. When his mother buys him a flowered swimming cap for his first swimming lesson, we encounter, not an amusing anecdote told in retrospect, but an excruciating moment of terror and shame. When a beautiful girl agrees to date him and the only way he can think of to kiss her is to suggest they try to beat a record of ten minutes set by a friend, a scene which in another writer’s hand would be laugh out loud funny, is imbued with paralysis and regret instead. This, I think, is part of Kausgaard’s appeal, that he awakens not so much similar memories in his readers, but similar emotions. 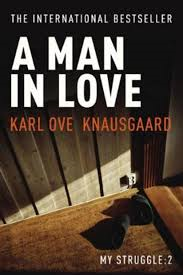 Superficially this conveys the importance of the truth of his account, but Knausgaard is careful to preface ‘true’ with ‘ring as’; the musical simile conveys the artistic truth of the account which is important rather than the documentary nature of events. You are currently browsing the archives for the Karl Ove Knausgaard category.